Submitted by witness on Saturday, March 23, 2013. 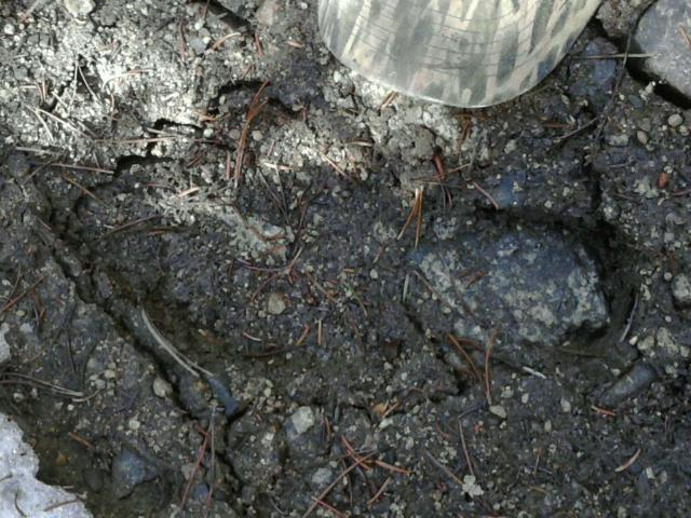 OBSERVED: Took a pic of a huge foot print in the mud. The witness was driving toward Lake Esler, when his truck got stuck in the overflow. It was late June 2012, and the water was running very fast out of the lake and down a ravine. He had to leave the truck, and walk out for help as the truck got flooded right up to the floorboards. The next morning at around 10:30, he and two friends came back to tow his truck out. As they hooked up the truck, they discovered a large footprint about 30 feet from the truck. The witness is a Native Montanan. He is a hunter and a prospector, and he knew the print was very fresh. 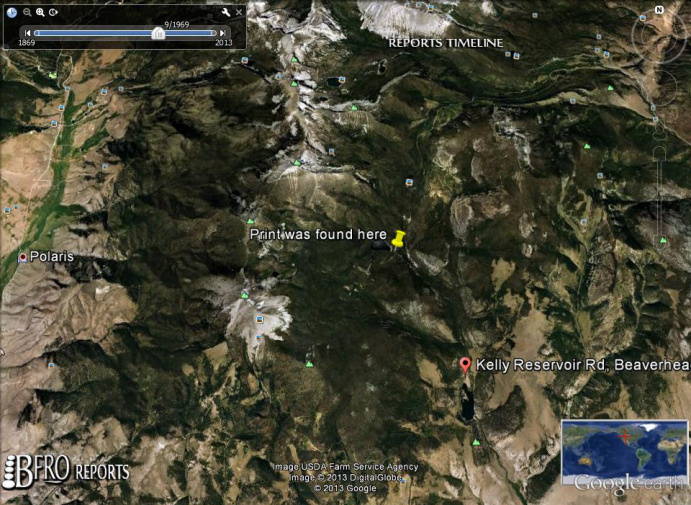 He and his friends speculated that the sasquatch walked down the fast flowing ravine to the truck. It seemed to them that the sasquatch had been looking at it when they came back, scaring it away. They could see that it had taken one more step over a snow bank into the woods. They both felt it was nearby and watching them as the woods were, “just too quiet” that morning. The photo is of the print with his cowboy hat next to it. His hat is 10 inches wide. While getting the details of this report, I asked him what he thought the print was of when he first spotted it. He said he knew exactly what it was as he had seen a bigfoot in 2000. He was hunting near Deerhead Lake that summer, and from a hill he thought he saw a bear clawing at a stump. He was about 100-150 yards away and he stopped to watch it. After a few moments, he realized it was not a bear. It was dark chocolate brown, squatting down and bending over the stump, hitting the stump with a chunk of wood. He watched it pick things from the stump and put it into its mouth. He assumed it was eating bugs of some sort. Its back was to him, but he could see it used its right hand to hit the stump. It was very muscular, and had very broad shoulders that he estimated at 5 feet wide. It moved just as a man would. As he watched, its body language changed. It stopped eating and stood up revealing it to be 8 ½ -9 ft. tall. The witness states that it turned to look at him, and threw down the wood as if it was angry. The witness says it literally stomped away in a fast clip like a kid that was having a tantrum. The witness adds, “I could tell he was mad at me for watching him!” It was too far away for facial details. He believed the stump was of a spruce tree. The witness is very familiar with the flora and fauna of the Montana mountains. I found him extremely credible, and knowing.